One of the features of this year’s Republican nomination calendar is an unusually large gap separating the first few voting states from the larger block of states that vote in March. The gap resulted because Florida, Iowa, Nevada, New Hampshire and South Carolina moved up their voting dates by roughly a month from their original schedule while most of the others remained in place. This is perhaps most easily observed by comparing the voting date for the New Hampshire primary to that of Super Tuesday, as I have done in the table below. The term Super Tuesday first came into wide acceptance in 1984 when a large block of mostly Southern states decided to hold their contests on March 13, 1984, two weeks after the New Hampshire primaries. Note that in two years, 1996 and 2004, there was some ambiguity as to which was the “real” Super Tuesday, as several important states voted together on a Tuesday before the traditional Super Tuesday date. But by either definition, Super Tuesday has taken place on average three weeks after the New Hampshire primary, and it has never been longer than five weeks after. 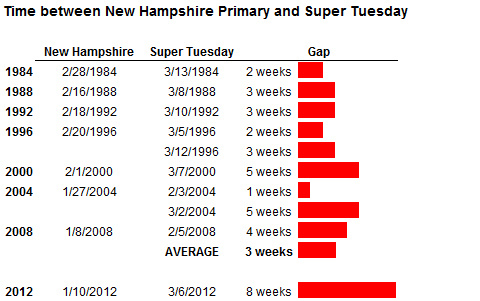 In 2012, however, New Hampshire’s primary (on Jan. 10) and Super Tuesday (on March 6) are a full eight weeks apart. Some states, of course, vote in between. Nevertheless, there will not be a lot of action at the ballot booth between the Jan. 31 Florida primary and the Michigan and Arizona primaries on Feb. 28. Although victories in Iowa and New Hampshire often produce a lot of momentum for a candidate, leading to a chain reaction wherein the winner continues to perform well in subsequent states, there is some evidence that the momentum has a sell-by date. One such example was in 1980, when George H.W. Bush upset Ronald Reagan in the Iowa caucuses. Mr. Bush, who had been well behind Mr. Reagan in New Hampshire polls, surged after his Iowa victory, eventually leading Mr. Reagan in several surveys. But there was an unusually large gap between Iowa and New Hampshire that year — 36 days — leaving Mr. Reagan with plenty of time to recover. He was able to win New Hampshire by a commanding margin, 50 percent to 23 percent, and had a fairly easy path to the nomination from there. So say, for instance, that Newt Gingrich wins Iowa, just gets over the top in New Hampshire and wins there as well, and then also goes on to win South Carolina and Florida. Or say that Mr. Gingrich loses New Hampshire narrowly but nevertheless wins South Carolina and Florida: that would still be enough for him to be declared the “winner” of the early-voting states. Either of these outcomes seem plausible at this point. This year, however, a candidate like Mitt Romney would have more time to regroup after an early setback. I’m not just picking Mr. Romney’s name out of a hat. It seems that the candidate who could benefit the most is one who had stronger “fundamentals,” like fund-raising, campaign infrastructure and institutional support, which could potentially outlast transient swings in polling. That describes Mr. Romney better than it does someone like Mr. Gingrich, who does not perform well in these areas. The long gap in the nomination calendar could also give Republicans more time to contemplate how their nominee might perform against President Obama, a comparison that might not help Mr. Gingrich. Put another way, there would be more time for the party and its voters to develop “buyer’s remorse” over their apparent nominee. The news media — which has some incentives to keep the horse race going — might play along, applying more scrutiny to him while seeking out any sign of hope that Mr. Romney’s campaign was still alive. To be clear, this would not be Mr. Romney’s preferred path to the nomination. If party elites seemed to want to overturn the will of the voters, their intervention might not be successful — and it could tear the party’s base apart in the process. So to have any chance, Mr. Romney would have to perform credibly well in the early states even if he didn’t win most of them. He’d also want to avoid a strong performance from a candidate like Jon M. Huntsman Jr., who has similar credentials to Mr. Romney and who could compete with him for the remaining sliver of the party’s establishment’s support. But if Mr. Romney passed these tests, he could still be viable. Suppose that Mr. Romney performed well in the early-voting states rather than poorly. Could the gap in the calendar then hurt him instead of help him? Perhaps. Other things being equal, the stretched-out calendar will tend to make the early-voting states less important. But other things also being equal, Mr. Romney’s campaign is better prepared for the long haul than almost all of its rivals. Meanwhile, the few contests that do take place between Florida and Super Tuesday — like the Michigan primary and the Colorado and Nevada caucuses, tend to be in favorable states for Mr. Romney, which should allow him to get a good headline here and there. The broader lesson, however, is that if you’ve enjoyed all the twists and turns in the Republican race so far, the elongated calendar should leave plenty of time for a few more of them.